Located in the heart of Ogden, you'll find a 152-acre nature preserve and education center open to the public year-round. Visitors enjoy 1.5 miles of walking trails, picnic areas, tree houses, bird blinds and an exhibit of live birds of prey. Two of Utah's greenest buildings are on site to teach about sustainable structures. A unique gift shop is located in the Visitor Center. The Ogden Nature Center offers a wide variety of classes & workshops for all ages including art, photography, birding, wildlife in Utah, outdoor recreation, conservation, sustainability, summer camps and more. The 152-acre preserve is our foundation, but education is our focus. Each year the Ogden Nature Center brings more than 27,000 children, teachers, and adults together with nature through hands-on field classes. Participants in our education programs, both for school groups and for the community, observe and learn about plants and animals up-close, discovering the pleasure of being in nature and realizing their own connection to the environment. The center is open to the public for discovery and exploration. Visitors enjoy meeting bird of prey, snakes, tortoises, salamanders and other native animal species. Outside there are picnic areas, treehouses, bird blinds, a spotting tower and 1.5 miles of walking trails. 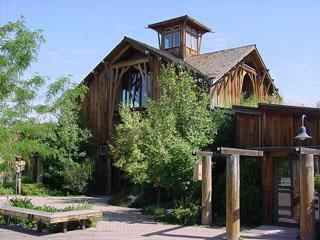 The Nature Center boasts two of Utah’s greenest buildings, with hands-on nature exhibits and a unique gift store.